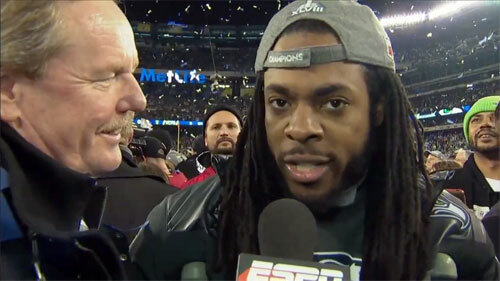 Photo shows Seattle Seahawks cornerback, Richard Sherman, speaking with ESPN after their Super Bowl XLVIII victory over the Denver Broncos on February 2, 2014. If you would like to book football speakers or athletes like Richard Sherman for a speaking engagement, autograph signing, product endorsement, fundraiser or special event, contact Richard Sherman’s booking agent for appearance and speaker fees at Sports Speakers 360. For booking agent and appearance fee information on how to hire Seattle Seahawks players for appearances, call 1.855.303.5450.